Ok so these Missoni for Target silk pants seriously set me free when I spotted them. I could care less that they are actually pajama pants *shhhhh* ;-) I was too excited to add this super BOLD print to my wardrobe. 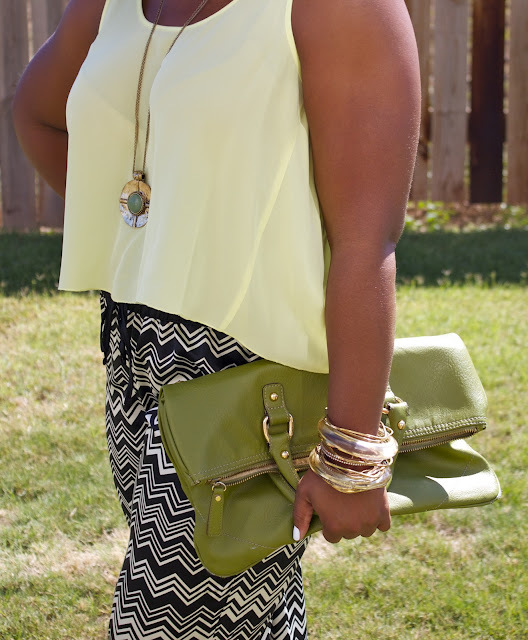 I have been focusing on "building on the basics" and stuck with bold solids when replacing my closet. I do believe I have a great mix of bold brights, neutrals and essential classic pieces so these pants were taking a step outside my box but I feel were the perfect addition. I envisioned rockin these pants with the perfect tangerine button up, floppy hat and arm stacked with goodies. Until the tangerine top enters my life I took the opportunity to play with a few tops I had in my closet and different accessories to see what worked best.....what do you dolls think?? Purple or Yellow?? Special WELCOME to all my new followers Diamond Dolls! Thank you so much for checkin out my blog and following my fashion journey!! These blue shoes are very beautiful! I love the second outfit and those blue shoes are amazing! You know what I like about your fashions the most? They are affordable! You mix hi-end with a budget consciousness. It makes me feel like I to can dress nice, not spend all my money, and it not look "cheap" kudos!! Love them & you can't tell that they are pajama pants. Great fashion sense. I love the flowy top and you would never be able to tell those are pj's the way you're rocking them. LOL I love the blue top and shoes! Thank you ladies! So hard to choose which top I love them both! If you have any FAB pajama pants I would love to see you style them for a daytime look. Go on try it! I would have wore the pajama pants as regular pants too. new follower from your FBD feature. LOVE your blog, I literally sat and went through every single post the day I started following. I must admit I'm very underwhelmed and confused why everyone went so crazy for this Target collection as I don't think the pieces are so amazing as everyone else does. BUT THEN YOU POSTED THIS AND CHANGED MY MIND! well kinda! lol. 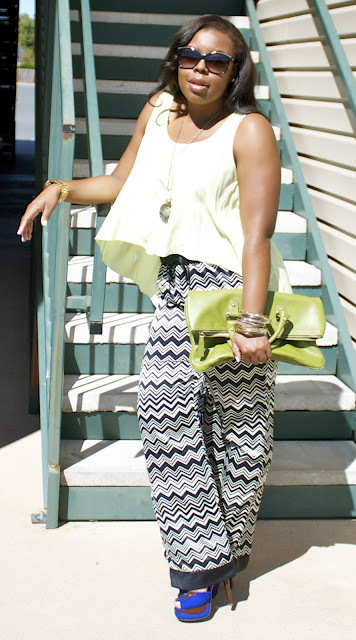 I love these pants and you wear them extremely well! Lovely look, can't wait to see more from you doll! See I saw those joints and never thought to wear them outside the crib, creative lady!